Convert any 44 gallon trash can into an outdoor trash receptacle for a commercial or residential environment with Rubbermaid's Brute Trash Can Lid. Constructed with run-off channels that disperse liquids to prevent pooling, this can lid is perfect for the outdoors. Comprised of an all-plastic, professional-grade formula that will not rust, chip or peel, and resists dents. 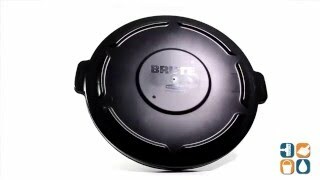 The Rubbermaid 44 Gallon Brute Self-Draining Trash Can Lid fits all Rubbermaid 44-gallon Brute Trash containers (RCP2643-60BLA, sold separately). CSFM Approved for fire safety when used as a container/lid combo. Dimensions: 24-1/2" in diameter x 1-1/2"H.